I let a few weeks slip by on this website without a post but it hasn’t been for nothing. I have been hard at work on many things behind the scenes, one of them being working with Blurb to re-release Portfolio Vol 3 at a new lower price. I have also been spending time designing and modeling up a project that will give me some new geometry to create illustrations with. This project was chosen to allow me to experiment with certain ideas that I haven’t covered in depth in the past. Specifically, I want to look at diagrams and how to generate them quickly and easily. This project is also located in an urban environment. I have worked on a few urban renderings in the past, but this one is a little different and sits on the waterfront. This means more opportunities to experiment with illustrating water, water reflections, and how the architecture meets the water. 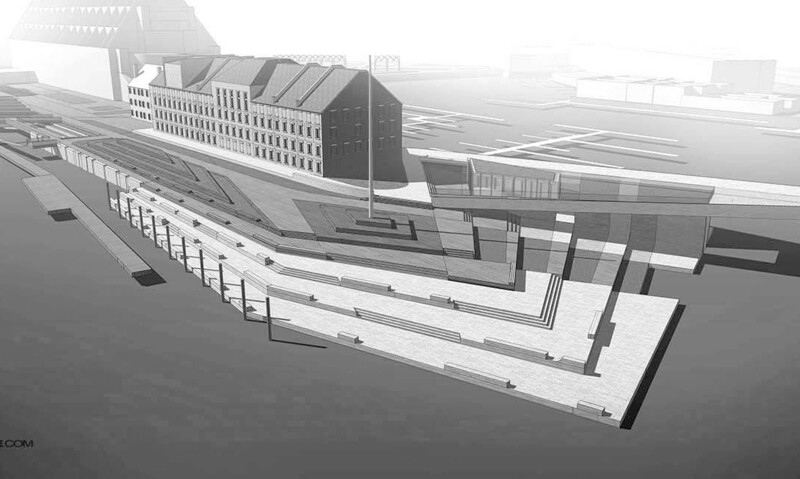 The plan for this project is to redesign Long Wharf in Boston, Massachusetts. I visit this area often and it is one of my favorite places to go in the city. It is a busy hub for many of the city’s ferries, harbor cruises, and whale watching tours. In the summer months, this area can attract many tourists due to its mix of water traffic, views of the harbor, historical context, and nearby aquarium. I am interested in rethinking the use of this wharf and how people inhabit the many different spaces. Without getting too deep into the specifics, the complexity of the context offers up many different avenues to explore architectural visualization. The design is in its final stages but still needs much refinement. I have plans to start with some macro site analysis diagrams but then move into diagramming the design of the wharf itself. The other opportunity with this project is the use of texture and the crucial role texture will play in the proper reading of the design. Finally, I want to make it a point to be more explorative with graphics therefore expect some not-so-mainstream styles. So, those are my plans, but let me know your thoughts and what you would like to see graphically. If I receive a lot of feedback for a specific type of visualization then I can try to incorporate it into a future post. I would be interested in seeing the dialog between the initial exploratory diagrams at the beginning of the project, the working diagrams whilst proceeding through design development, and the final explanatory diagrams you're specifically aiming to create. I come from a background that's exceptionally heavy in diagramming at all stages of the project; even though this isn't exactly wide-spread, I've come to see even basic sketches as diagrams unto themselves (perhaps in need of only a little elaboration for the sake of legibility). Seeing all of those diagrams together (either in their original form or a little cleaned up) is a beautiful way of describing not just what the project does at the end of design, but how those ideas were conceived any why they make sense – because if anything, a diagram should answer the question of "why" and not just "how." Anyways, I look forward to seeing what you come up with! I have a same comment as Chris. I would like to see the initial exploratory diagram that explaining the beginning of whole design project. I'm looking forward to your update as well! Really like your tutorials and style a lot! I came across a site today (http://www.montpellier.fr/4127-folie-richter.htm) with renders you might like, or even fit your aim for this project. Looking forward to your progress on this. Wasup Alex, I'm an undergrad Architecture student all the way in Kenya and your work has been my main source of inspiration. I love incorporating water into my designs so I'm really looking forward to see what you do in this project, especially shots of the design from the water feature here, and how you will manage to harmonize architecture with nature. @Godwin, thanks for the comment and I am also excited with experimenting with how the water is treated in the upcoming illustrations and the relationship it has with the architecture. Looks like Long Wharf in Boston to me. Awesome Site. Great stuff Alex. I look forward to the new project. You have been pushing the exploratory qualities of the work for some time now…I'm wondering; will you provide tutorials for these visualizations or will it just be final output? I really appreciate your work. It's a source of inspiration. Thanks a lot. I found this explanation but it seems that the software doesn't exist now (the technique is from 2003) : "This image was exported from SketchUp to Renderstudio 4.0 where it took less than a day to render. I mostly used the watercolor tool with the "Payne's Gray limited palette" plugin and the "Canson Aquerelle paper" background effect. The thin lines are the "technical pen" tool and the thicker profile lines are the "Artline Calligraphy Pen" tool (both using the "Quick freehand" style). The plants are done using the Random Scumble style and the trees are from the QuickTree library plugin." (from the author Grant Marshall). Do you think that it would be possible to reproduce this effect using sketchup and photoshop?